Our alternate day block schedule simulates that of the college environment and prepares students for the organizational and time management demands they will face after high school. The schedule is built so students take eight classes for the entire year. 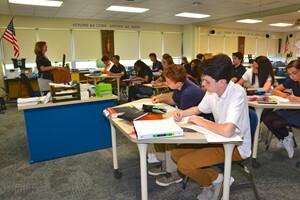 The classes are divided into a schedule where a student attends four classes every other day, Blue days and Gold days. With the extended periods of class time available, teachers can build toward higher-order thinking skills and explore connections between disciplines. Collaborative learning and other forms of group learning are ideal for block scheduling.